News now from Frank Grzeszczak Sr and Jr at International Yacht Collection of a $245,000 price drop on the 24.4m motor yacht Life of Reilley. 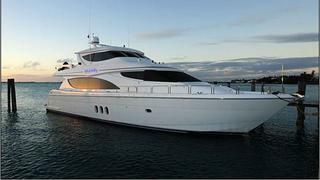 Life of Reilley is a late 2006 80ft Hatteras with an enclosed pilothouse. She’s been meticulously maintained by both her first owner and current owner alike, with no expense spared in upkeep of the yacht. In 2010, she was updated with an interior refit by a professional yacht designer, and in 2011 she had additional teak decking laid on the boat deck. She's a four stateroom vessel, with two crew cabins. Each of the staterooms have full ensuite bathrooms, with the master having both his-and-hers sides, separated by a gorgeous, marble walk-in shower. She has a spacious main saloon and country kitchen style galley. The enclosed pilothouse provides for a large and comfortable sky lounge. Life of Reilley is down from $3,995,000 to $3,750,000.